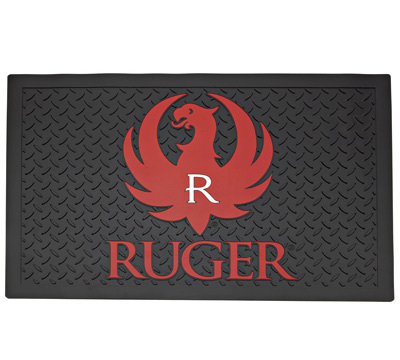 Black and red floor mat features the Ruger logo and is made of a dense, rubber-like, durable vinyl. 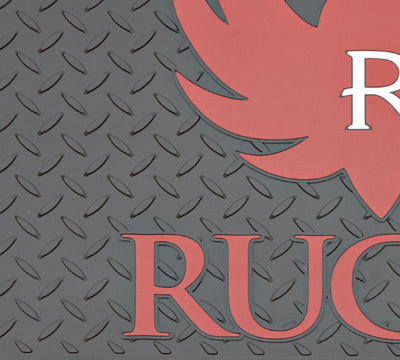 This heavy mat weighs over 7 lbs. and is designed to stay in place when wiping your feet while the diamond-plate tread pattern helps remove dirt from shoes. Dimensions 24" x 36". WARNING: This product can expose you to chemicals including phthalates, which is known to the State of California to cause cancer and reproductive harm. For more information go to - www.P65Warnings.ca.gov.